Aztec Dances was commissioned by Christopher Orton, with the assistance of the BBC Performing Arts Fund. The premiere was given by Christopher Orton (recorder) and Magdalena Nasidlak (piano) at a concert in the Manchester Midday Concerts series at the Bridgewater Hall, Manchester, in March 2010. A year later I created a version for flute and piano specially for Wissam Boustany, who premiered it with Aleksander Szram (piano) at St James’s Church, Piccadilly, in May 2011. Finally, a version for flute and instrumental ensemble of 13 players was commissioned by Adam Johnson and the Orchestra of the Northern Lights, with funding from the John S Cohen Foundation, and was premiered in May 2013 at St Martins-in-the Field, London, with Dan Watts (flute). The idea for the genesis of this work, and indeed its title and individual movements, came after visiting an exhibition at the British Museum entitled Moctezuma – Aztec Ruler. The exhibition traced the events following the election in 1502 of Moctezuma as Supreme Ruler of the Aztecs, and the subsequent invasion in 1519 by a Spanish expedition led by Hermán Cortés – an event that was to eventually lead to the demise of the Aztec civilisation. Part of the exhibition explored the role that music and dance played in Aztec life. The primitive recorder together with trumpets and drums were used as an important part of the formal ritual ceremonies (including, rather gruesomely, human sacrifice) that took place to appease the many Gods whom the Aztecs worshipped, as well as for other formal and informal occasions in their social and cultural life. The titles of the movements are: Ritual/Pastorale, Fertility Dance, Ghost Song, Sacrificial Dance. I have tried to reflect some of these highly contrasting and dramatic ideas in this four-movement work, where a multitude of colours and textures are exploited, as are more lyrical and highly charged rhythmic ideas. The extended slow movement, Ghost Song, exploits inside-the-piano clusters and instrumental echoing, speaking voice, and humming, as well as a poignant melody, as if trying to appease the ghosts of their ancient ancestors; whilst the highly-charged final Sacrificial Dance, full of changing time patterns, makes a passing reference to Stravinsky’s Danse Sacrale, the final section of his wonderful and iconic Le Sacre du Printemps. 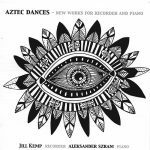 …and flautist Katherine Baker and pianist Tim Horton’s vibrant rendering of Edward Gregson’s wide-ranging Aztec Dances.